Round cabochons of sky blue turquoise are centered in fiery sun frames of polished sterling silver to create these captivating drop earrings. Finished with sterling hooks, they are a striking accessory that’s sure to draw compliments. Rhodium overlay on the silver adds a bright, tarnish-resistant finish. 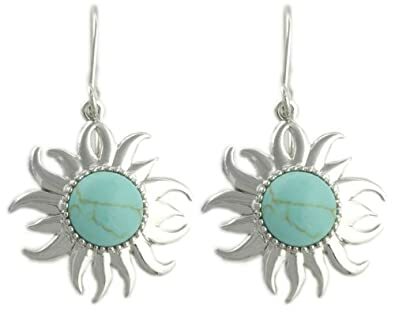 Buy this item and receive 63% off Sterling Silver Turquoise Sunshine Drop Earrings.